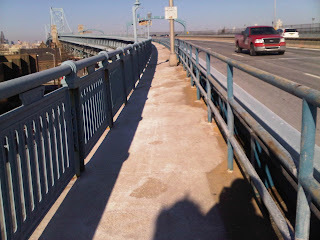 A tip of the helmet is due to the Delaware River Port Authority. In snowfalls past, DRPA has been slow to reopen the Ben Franklin Bridge walkway. This time, they've done an excellent job opening the walkway for today's rush hour. Bridge crews put a thorough coating of road salt on the walkway, with more in the normally icier spots at the Bridge anchorages.